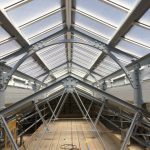 We are delighted to have worked alongside BAM Nuttall Ltd on the recent refurbishment of Lewes station roof in East Sussex, providing them with our lightweight, quick to fit, Georgian wired polycarbonate Multi-Link non-fragile rooflights. I visited Lewes Station on a fairly cold April day for our initial site visit to review the roof. Looking around I could see that it had some unique characteristics, from the ornate pillars and feature brick building housing the café, to the many flower beds. All these showed that the station was well cared for and much loved. It had a real feeling of history about it. 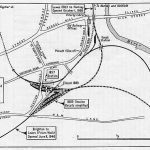 Lewes is clearly a station steeped in history and character as there has been a station here since June 1846, although the first one was really more of a terminus. The full station with a Swiss chalet style building was opened in 1857. 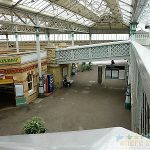 However, despite the great features I could see when I visited, it was evident that the years had caught up with some areas of the station and the roof in particular was in need of repair. The old glass was failing in places. It was cracked, discoloured and in some areas it was actually missing. Locations that should have been light and bright were not at their best due to the condition of the existing glazing. It was easy to imagine the improvement new glazing would make and why we had been asked to look at it. 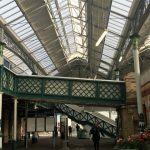 The remit for Lewes was to replace the 1,178 panels of roof and vertical glazing. 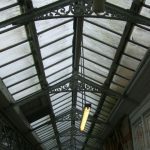 The product that we put forward was our Georgian wired polycarbonate Multi-Link non-fragile rooflights. 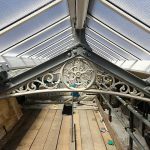 For me it’s important to retain the feel of a station, so a sympathetic restoration is crucial. However, I now also think it’s essential to not just replace like with like, as although traditional materials may look the same there are often disadvantages associated with them. I think Georgian wired glass is an example of this. 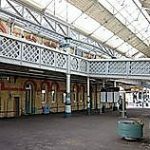 It suits these old stations, it is in keeping, but it just replicates the same old problems; it breaks, it needs replacing. The cycle continues. Durability and sustainability are key in any refurbishment, why replace with something susceptible to breakage? So this was an easy one to solve, the product needed was our Georgian wired effect polycarbonate. This polycarbonate glazing mimics the traditional Georgian wired glass that it will be replacing, but it will not break in use. It is therefore safer to install and to use as an overhead glazing material, with no risk of glass cracking and shards or glass dust falling onto the platform below. 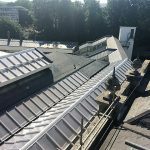 The long term cost saving of not needing to replace broken panels, accompanied by the massive safety advantages of not worrying about falling glass, just have to be considered as key benefits of our Georgian wired polycarbonate roof glazing. Georgian wired polycarbonate also has the additional benefit of being lighter than glass, therefore making it easier and quicker to install on a roof. When it replaces glass it does not usually require any extra structure being put in place as it is normally considerably lighter than the original glazing. 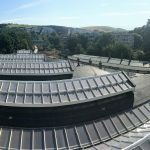 Our Georgian wired polycarbonate is pre-glazed in our Multi-Link framing system which has a number of advantages over the old style two-part glazing bars that are put together on site to create a glazed roof. The Multi-Link system is made in our factory and incorporates an innovative fix and link installation feature that makes it very quick to install. So once on site there is less disruption at a station, which is important as the public needs to be serviced as normally as possible during building works. This panel system also results in fewer errors on the install as we do the work to get it right before it hits the site. Our Multi-Link framing system has also recently been redesigned to be narrower (50mm) in order for it to align with older style glazing bars, keeping and recognising the importance of the traditional look whilst providing the advantages of a more modern style system. In fact, we designed this 50mm panel bar on a 3D printer. It’s good to see how such a traditional station has been enhanced by cutting edge technology! Our Multi-Link roof glazing is also non fragile to ACR(M)001:2014, which is a key feature of all our station roof glazing systems. When the life of old glazing on a roof is over it needs to be replaced with non-fragile roof glazing to limit risks on the roof. 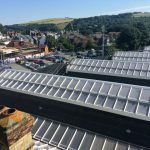 All these advantages led to a successful roof reglazing, providing Lewes station with a non-fragile, virtually unbreakable and attractive roof that keeps the feel and look of this heritage station. Any hurdles that were met were overcome by our Twinfix team working closely with BAM, with one joint goal in mind, completing the project successfully. Now finished, I think it’s a wonderful example of our Georgian wired Multi-Link product and I think that Twinfix, BAM Nuttall and Lewes station can be very proud of these refurbished premises. 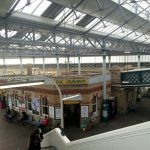 We all need to continually challenge ourselves, our thinking and our products, and look for ways to use modern products effectively and I think Lewes station is a great example of how a contemporary material has fulfilled the Heritage needs of a listed building.